Discount Magic - Muldoon Match. This easy-to-do card trick is a beauty! In short, three face-down cards are labled (one by one) and three spectators guess what they are. The three mates (of the spectators' guesses) are tabled (one by one) face up. Guess what? The face-up cards match the face-down ones! No Forces - No Fast Moves - No Kidding! Gaffed card supplied and you use your own Bicycle Cards. 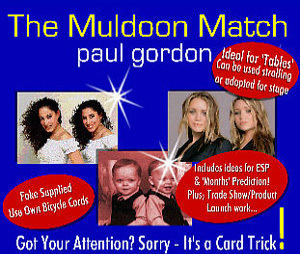 Muldoon Match This easy-to-do card trick is a beauty! In short, three face-down cards are labled (one by one) and three spectators guess what they are. The three mates (of the spectators' guesses) are tabled (one by one) face up. Guess what? The face-up cards match the face-down ones!